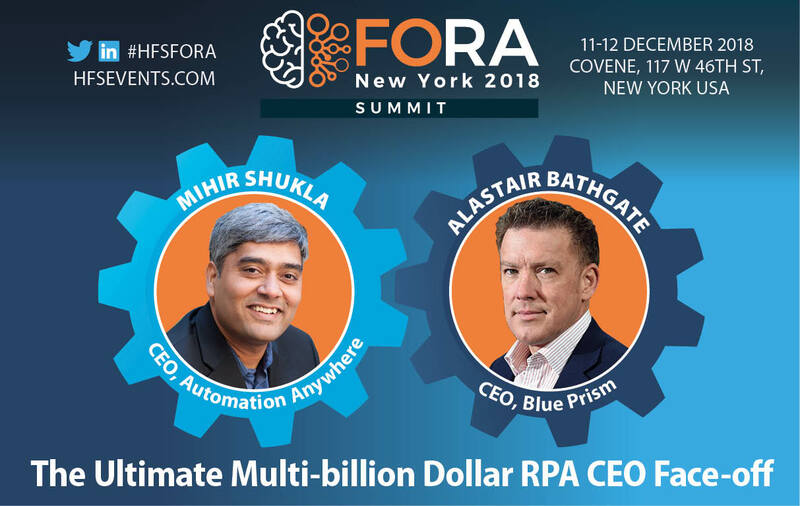 After all the fun and games we sparked with our recent blog "Seven deadly misnomers why these billion dollar RPA valuations are insane" we thought we'd give the CEOs of the leading two RPA firms (see the new HFS TOP 10 RPA report), Automation Anywhere (Mihir Shukla) and Blue Prism (Alastair Bathgate) a chance to face/off on stage to thrash out why their firms' valuations are on such an exciting trajectory - and engage with the HFS FORA crowd to debate where the hell this space is really going and how we need to prepare for an intelligently automated future. Yes, people, this year's HFS FORA Summit in New York from December 11-12 is shaping up to be at our boldest, most brazen and brash best. Ever! If you're looking to up your RPA game and see who comes out on top, sign up to reserve your seat now, or forever hold your peace.